In 1972 Hsiang-Lai Wen in Hong Kong discovered needles inserted in the ears help physical withdrawal symptoms from opium. Next year Wen and Cheung publish their discovers and results in Asian Journal of Medicine. In 1974 Lincoln Hospital at South Bronx New York, Dr. Michael O. Smith, MD a psychiatrist and medical director of Lincoln Detox Program started use ears acupuncture at detox clinic. 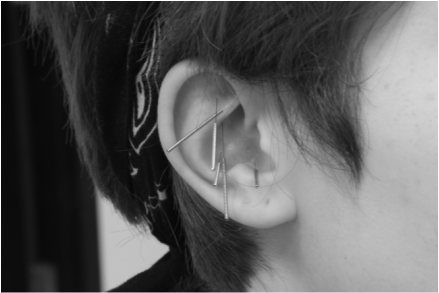 In 1982 Dr. Smith published an article in The American Journal of Acupuncture described how five ear acupuncture point help patient reduce drug withdraw symptoms. In 1985 Dr Michael Smith, MD founded The National Acupuncture Detoxification Association (NADA). In past 20 years, NADA five point ears acupuncture detoxification protocol has been adopted by many hospital, and detox clinic in different State. The NADA protocol also adopted in many countries including United Kingdom, Germany, Finland, Russia, Ireland, and Sweden etc., to treat addiction and substance abuse. Acudetox involves insert 5 small needles in specific sites on each ear. (The needles are sterilized single use disposable stainless steel needles). After the needles insertion, you should be sit or lying down quietly for 30 to 45 minutes. The treatment is a non-verbal process with minimal interaction between you and the provider. The quiet setting help you become relaxed and more comfortable with your own thoughts. In the beginning of the treatment, it is offered frequently (2 to 3 time a week), for some people even daily if possible. Acudetox has been shown significant decrease of cravings for alcohol and drugs withdrawal symptoms, relapse episodes, anxiety, insomnia and agitation. Acudetox help opens up possibilities of the body, mind and spirit levels.